The Samford University Class of 2020 moved into residence halls Friday, Aug. 26, with eager anticipation and pride in being part of a record freshman class. The class of more than 920 includes students from 31 states and 11 countries and are part of an expected record total enrollment of more than 5,300. 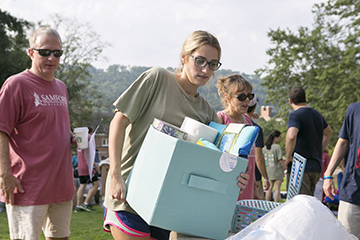 Julianne Jorgensen of Memphis, Tennessee, moved into Vail Hall for women with the help of her parents, Kim and Bill Jorgensen, and volunteers from Samford and the community. “Move-in is always great. By the time I get the car parked, everything is in the room,” said Bill Jorgensen, who speaks with experience since Julianne is his third child to attend Samford. Samford President Andrew Westmoreland, he said, has helped move in two of them. “He is always there to help,” said Jorgensen, who dressed for the warm day in a very cool Doobie Brothers Tour T-shirt that Julianne bought him at a concert they attended this summer. The family’s middle daughter, Grace, is a Samford senior, and their eldest, Mary Kathryn, is a recent graduate who married Samford graduate Conner Davis. “I visited other schools, but I knew Samford very well, and felt comfortable here. I could see myself on campus,” said Julianne, who will be an English major and University Fellow. Her father recalled that when they dropped Julianne off at kindergarten, parents were invited to a “boo-hoo” session. This drop off, however, makes the couple more conscious of being empty nesters. “We are going to have our own boo-hoo break at the beach,” he said. They headed to Destin, Florida, once move-in day activities were done. Marsha and John Floyd, both 1985 Samford graduates, waited while their youngest son, Hampton, collected the key for his Smith Hall room. How will empty nesting work for them? “We’ll find out,” replied Marsha, who is pleased that campus housing has come a long way since her four years in non–air-conditioned Vail Hall, which has since undergone a complete renovation. “John lived in Pittman Hall, which is now a women’s dorm,” she said of her husband, a member of the Samford board of overseers and former member of the board of trustees. He also holds law and master’s in environmental management degrees from Samford. Eugenia and Craig Carter of Atlanta, Georgia, brought the youngest of their three children, Caleb, to Samford. Like the Jorgensen family, they are familiar with Samford move-in. Their daughter, Bethany, is a Samford junior and son Joshua is a May graduate. Caleb, who will major in business, said he visited other schools but felt Samford was where he should be. The sprinter looks forward to being on the Samford track team. Family friend Lamar Lussi was on-hand for a move-in tradition he started several years ago. The 84-year-old prays over the Samford dorm rooms of students who, like Caleb, are graduates of Providence Christian Academy in Lilburn, Georgia. “He’s the school’s director of encouragement,” said Eugenia. This year, Samford has about seven freshmen from the school in addition to a number of returning undergraduates. After his Samford visit, Lussi drove home for the academy’s first football game of the season and the naming of the new Lamar Lussi Athletic Complex in his honor. In Pittman Hall, freshmen Nicole Branham of Atlanta, Georgia, and Katie Brabham of Montgomery, Alabama, settled into the room they were decorating in coral and turquoise. The roommates, who met via the Samford Facebook app for new students and instantly developed a rapport through texting and messaging, have more in common than their very similar last names. Nicole, who plans to major in psychology, and Katie, who will major in athletic training, both look forward to participating in sorority rush. Another Pittman resident, Sarah Sharpton of Columbia, South Carolina, carries on a Samford family tradition that began with her paternal grandparents, Delos and Margaret Deluga Sharpton, who met at the school and graduated in 1970. Her dad, Michael Sharpton, graduated in 1996, and two aunts and assorted other relatives have also chosen the school. “Somehow, we all ended up here,” said Michael, who is pleased that Sarah will give the family a good reason to attend parent program events as well as homecoming. At an afternoon family welcome program, President Westmoreland urged the new students to do five things: go to class, read, connect with one faculty member and make at least one friend, and listen more than they talk. Finally, he said, trust the Lord “with all your heart, and lean not on your own understanding,” citing wisdom from Proverbs 3:5. His advice to parents was to go home, read, connect with each other and listen to their students, “who will speak differently than they did before college.” Lastly, he said, heed the same advice from Proverbs.